Maybe the best coffee time cookies? 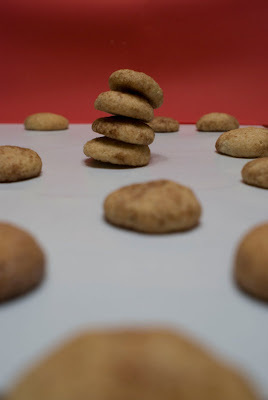 Snickerdoodles are probably the best coffee time cookies I have eaten, and also one of the simplest cookie recipes to do. Preheat the oven at 180º. In a bowl, mix the flour (previously sifted), salt, baking powder and nutmeg. Mix and set aside. Soften the butter in a microwave (or double-boil it) and mix it with the sugar, until it turns white and smooth. Add the egg (in 2 or 3 batches), mix and add the vanilla extract (if not added to the butter). Add (very slowly) the flour, while mixing. When the mix is firm and detaches from the bowl walls, it is ready. In a small plate, mix the remaining sugar with the teaspoon cinnamon. Make small balls of dough (ping-pong ball sized) and batter them with the sugar mix. Put all balls in a cookie pan, spread around 3cm each. Smash them (slightly!) with the bottom of a glass. Bake for 15 minutes, or until the sides look done. Turn the pan around, to bake uniformly the cookies. Let them cool a little before putting them in a cooling tray. You can find the recipe in Catalan in Shanidar's site.